Lobbyists for Citigroup, one of the country's largest banks, offered lawmakers draft language for a bill that was obtained by New York Times and Mother Jones reporters. And 70 of the 85 lines in the final House bill reflected Citigroup's recommendations. It's taken for granted that lobbyists influence legislation. But perhaps less obvious is that they often write the actual bills — even word for word. In an example a week and a half ago, the House passed a measure that would roll back a portion of the 2010 financial reforms known as Dodd-Frank. And reports from The New York Times and Mother Jones revealed that language in the final legislation was nearly identical to language suggested by lobbyists. It's been a long-accepted truth in Washington that lobbyists write the actual laws, but that raises two questions: Why does it happen so much, and is it a bad thing? The House bill passed on Oct. 30 essentially sought to wipe out a financial overhaul known as the "push-out rule." The rule prevents banks from using your deposits to trade in derivatives — risky securities that many believe contributed to the 2008 financial crisis. Marcus Stanley of Americans for Financial Reform says the regulation was a way to protect taxpayer money. "The purpose of this part of Dodd-Frank was to basically say that Wall Street derivatives activities should be funded by private money and shouldn't get a public subsidy, and this bill kind of reversed that," Stanley says. What the bill would do is exempt broad categories of trades from this rule. And here's what really ticked off consumer advocates like Stanley. The New York Times and Mother Jones obtained draft language that lobbyists for Citigroup — one of the largest banks in country — offered to lawmakers. And it turns out that 70 of the 85 lines in the final House bill reflected Citigroup's recommendations. In fact, as The Times reports, two paragraphs were copied almost word for word — except lawmakers had changed two words to make them plural. The House bill has slim hopes of passing the Senate. "It shouldn't be as a result of an investigative report by a newspaper that members of Congress find out that a bill put before them was actually written by one of the interests affected by it," says Democratic Rep. Daniel Kildee of Michigan. Kildee says no one ever told him before he first voted for the bill as a member of the House Financial Services Committee that Citigroup had drafted so much of the language. So later on the House floor, he voted against the bill. "It should have been made clear to all committee members as to where this was coming from," says Kildee, "and folks may have taken a different look, or a closer look, at the language if we had known it had been written by and for a particular interest." 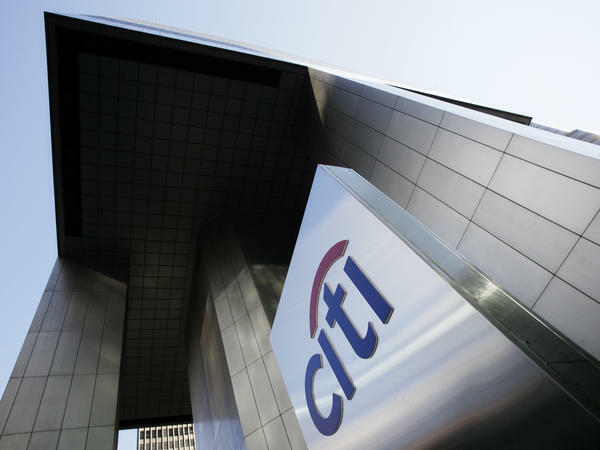 Citigroup declined to comment on its lobbying efforts, but in a May 2013 blog post it said that what it advocated was good for the whole financial system. "To me," says Lee Drutman of the Sunlight Foundation, a government watchdog group, "this is just another tick-tock on a story that's been developing for a long time — that Congress has basically outsourced its policy expertise to the private sector." As outrageous as this story seems, Drutman says, it's now unfortunately business as usual on Capitol Hill. "People on the Hill don't stay as long," he says. "You don't get as good people on the Hill. The expertise on policymaking more and more has moved to the private sector, and it's moved to represent those organizations and companies who can afford to pay for it, which generally isn't you and me. It's big banks and Big Oil and big companies." Drutman worked as a banking policy staffer in 2009 and 2010 handling financial overhaul issues. And what he saw around the Capitol was that congressional staff members were stretched incredibly thin. Lobbyists know this, says Drutman, so what they offer lawmakers is an all-in-one package — they'll help a lawmaker round up co-sponsors for the bill, even write talking points, as well as the specific bill language. "Sometimes it's two words. ... Sometimes you want to insert a 'not' or something," says Nick Allard, a longtime lobbyist at the firm Patton Boggs. Allard says before you think lobbyists are running Washington, consider this: Word choices in a bill have to be vetted and approved by lots of eyeballs in a long lawmaking process. So it's the members of Congress who voted for the bill — not the lobbyists — who have to take ownership over the final language. "So where it comes from — whether they see it on the back of a cereal box or on the Today show or on NPR or out of a lawyer who's acting as a lobbyist's word processor — doesn't matter, because if the member is proposing it, they are responsible for it and they have to make the case for why it's advisable," Allard says. Several of the House bill's sponsors didn't respond to a request for comment. And as for Kildee's concerns about transparency? Lobbyists aren't under disclosure requirements, so consumer advocates like Stanley say the public can't see what lobbyists have drafted for lawmakers — unless someone leaks it. "It's a little different when the American Cancer Society gives you some technical assistance on a cancer funding bill versus when one of the largest banks in the world, which was just recently bailed out by the public, writes you a bill that will give it access to public deposit insurance to fund its exotic financial activities," he says. And Stanley says the public has a right to know where policy expertise is coming from. It's generally assumed that lobbyists influence legislation. But in some cases, they actually write the bills word for word. A week and a half ago, the House passed a measure that would roll back a portion of the 2010 financial reforms known as Dodd-Frank. And news reports revealed that language in the final legislation was nearly identical to language suggested by lobbyists. NPR's Ailsa Chang reports. AILSA CHANG, BYLINE: What happened in the House reflected something most of Washington has long accepted. Lobbyists often write the laws themselves. So that raises two questions. Why does it happen so much? And is it a bad thing? Let's take a look at that recent House bill. It essentially sought to wipe out a financial reform known as the push-out rule. The rule prevents banks from using your deposits to trade in derivatives. These are risky securities that many believe contributed to the 2008 financial crisis. Marcus Stanley of Americans for Financial Reform says the regulation was a way to protect taxpayer money. MARCUS STANLEY: The purpose of this part of Dodd-Frank was to basically say that Wall Street derivatives activities should be funded by private money and shouldn't get a public subsidy, and this bill kind of reversed that. CHANG: What the bill would do is exempt broad categories of trades from this rule. And here's what really ticked off consumer advocates like Stanley. The New York Times and Mother Jones obtained a draft language that lobbyists for Citigroup - one of the largest banks in country - offered to lawmakers. And it turns out that 70 of the 85 lines in the final House bill reflected Citigroup's recommendations. In fact, two paragraphs were copied almost word for word, except lawmakers had changed two words to make them plural. REPRESENTATIVE DANIEL KILDEE: It shouldn't be as a result of an investigative report by a newspaper that members of Congress find out that a bill put before them was actually written by one of the interests affected by it. CHANG: Democrat Daniel Kildee of Michigan says no one ever told him before he first voted for the bill as a member of the House Financial Services Committee that Citigroup had drafted so much of the language. So, later on the House floor, he voted against the bill. KILDEE: It should have been made clear to all committee members as to where this was coming from, and folks may have taken a different look or a closer look at the language if we had known it had been written by and for a particular interest. CHANG: Citigroup declined to comment on its lobbying efforts but said in a blog post that what it advocated was good for the whole financial system. LEE DRUTMAN: To me, this is just another tick-tock on a story that's been developing for a long time, that Congress has basically out-sourced its policy expertise to the private sector. CHANG: Lee Drutman of the Sunlight Foundation, a government watchdog group, says as outrageous as the story seems, it's now unfortunately business as usual on Capitol Hill. DRUTMAN: People on the Hill don't stay as long. You don't get as good people on the Hill. The expertise on policymaking more and more has moved to the private sector, and it's moved to represent those organizations and companies who can afford to pay for it, which generally isn't you and me. It's big banks and big oil. CHANG: Drutman worked as a banking policy staffer in 2009 and 2010, handling financial reform issues. And what he saw around the Capitol was that congressional staff members were stretched incredibly thin. Lobbyists know this, so what they offer lawmakers is an all-in-one package. They'll help a lawmaker round up co-sponsors for the bill, even write talking points, as well as the specific bill language. NICK ALLARD: Sometimes it's two words, right? So, you know, sometimes you want to insert a not or something. CHANG: Nick Allard, a longtime lobbyist at the firm Patton Boggs, says before you think lobbyists are running Washington, consider this. Word choices in a bill have to be vetted and approved by lots of eyeballs in a long lawmaking process. So it's the members of Congress who voted for the bill, not the lobbyists, who have to take ownership over the final language. ALLARD: So where it comes from, you know, whether they see it on the back of a cereal box or on the "Today" show or on NPR or out of a lawyer who's acting as a lobbyist word processor, doesn't matter because if the member is proposing it. They are responsible for it and they have to make the case for why it's advisable. CHANG: Several of the House bill's sponsors didn't respond to a request for comment. And as for Congressman Kildee's concerns about transparency? Well, lobbyists aren't under disclosure requirements, so consumer advocates like Stanley say the public can't see what lobbyists have drafted for lawmakers unless someone leaks it. KILDEE: It's a little different when the American Cancer Society gives you some technical assistance on a cancer funding bill versus when one of the largest banks in the world, which was just recently bailed out by the public, writes you a bill that will give it access to public deposit insurance to fund its exotic financial activities. CHANG: And Stanley says the public has a right to know where policy expertise is coming from. Ailsa Chang, NPR News, the Capitol. Transcript provided by NPR, Copyright NPR.